Located about halfway between Vienna and Salzburg, Linz is Austria's third-largest city. It is an elegant city with an interesting historic Old Town Quarter with many nice patrician houses and a large pedestrian zone. Start exploring the city on the Main Square and then work your way to the Old Town Quarter. There is much to discover here, from original Roman foundations to vaults dating from medieval times. The city is now home to a vibrant music and arts scene. Between the Lentos Art Museum and the "Brucknerhaus", is the "Donaulände", which is also referred to as "Kulturmeile" ("culture mile"). This is a park alongside the river, where the Ars Electronica Festival and the "Linz Fest" take place. Bad Hofgastein is a market town and the historical hub of the Gastein Valley, located in the sunniest point of the valley. This resort is almost a satellite of the larger spa, Badgastein, as its radioactive waters are pumped from its neighbor. It is smaller than Badgastein but almost as charming. The skiing, mountains and Gastein's Alpen Therme create a unique ambience, where you can experience a wide range of sporting opportunities, both in summer and winter. You can also treat yourself to the joys of a variety-filled music and cultural programme. Bad Ischl is one of the country's most fashionable spas and was the summer seat of Emperor Franz Josef for more than 60 years. 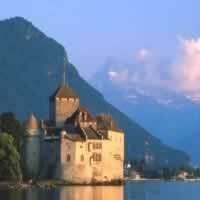 Located by a mountain, by a river and near several skiing areas, it offers a wide choice of activities: trips with the cableway, visits at the Emperor's Villa, the Salt Mine, the Operetta Festival or the Salzkammergut Gulf Club, sporting at tennis courts, hiking or cycling. Take time and explore Lake Wolfgangsee on a horse-drawn sleigh ride. 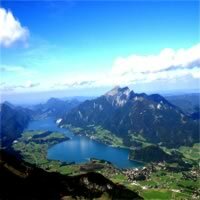 Balloonists will find a paradise on Lake Wolfgangsee. This lake also offers: ice fishing, ice skating and alpine curling. Winter walks in the Bad Ischl - Wolfgangsee region are special. Skiers can take advantage of the nearby "Katrinalm" ski area. 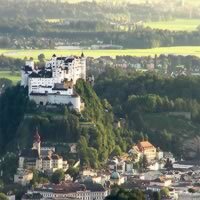 Famous for its mountains, beautiful lakes and winding rivers, the Salzburg area is a stunning region. 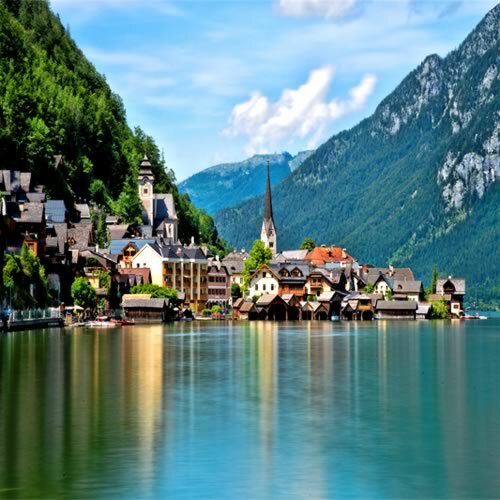 The birthplace of the famed composer Mozart and the film setting for `The Sound of Music,` the city offers amazing history, beautiful scenery, incredible music, and some great culture. 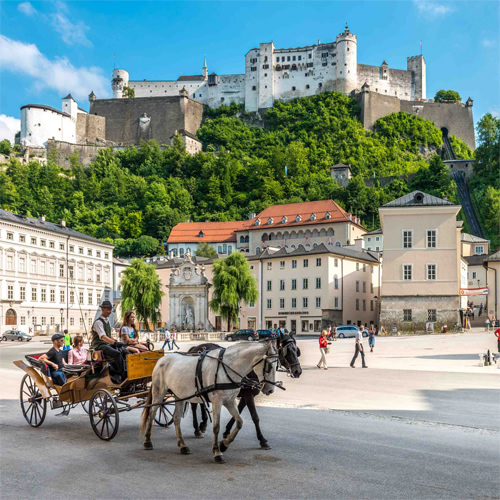 While you`re here, take a stroll through the Gothic Festung Hohensalzburg, tour the beautiful Mirabell Gardens, visit the birth place of Mozart, wander through the magical palaces and castles, or dine on schnitzel and dumplings in the Altstadt (Old Town) district. We guarantee you’ll find Salzburg to be one of the most beautiful, enchanting cities in all of Europe. Two cities that you cannot miss in Europe! Salzburg (the `Golden City of High Baroque,` known as the Florence of the North; the birthplace of Mozart, all names to describe this beautiful, musical city) and Vienna (city of music, cafes, waltzes, parks, pastries, and wine with stately streets and Baroque palaces). Travel between them by train. This is a flexible package. Select your number of nights in each city, desired hotel and activities. Christmas Markets are a tradition across Europe; a way for everyone to gather and celebrate the glory of the season. They feature unique shops with handmade decorations, not-so-unique shops with more mass produced goods and, of course, amazing food! These markets are some of our top selling vacation packages in Europe. With this magical vacation package, you will begin with fairy tales and folk-lore at the Prague Christmas markets (ideally suited for children), then continue to the 700 year old Christmas Markets of Vienna, one of the most well rounded and finish with the smells of Christmas as the rich aromas of glühwein, roast chestnuts and freshly baked gingerbread from the numerous markets mingle in the cold air of Salzburg. Transportation between cities by train.This is a flexible vacation package. Select your number of nights in each city, desired hotel and activities. 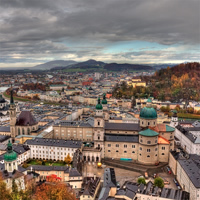 Art lovers call Salzburg the Golden City of High Baroque; historians refer to it as the Florence of the North, or the German Rome; and music lovers know it as the birthplace of Mozart and home of the world-famous Salzburger Festspiele (Salzburg Festival). 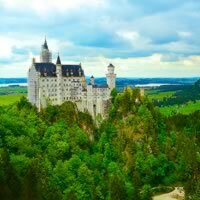 Take an exciting, unforgettable vacation through Europe with our customizable package! Begin your adventure in Berlin (a cultural powerhouse in east Germany; despite its gloomy communist era past it is leading the world in theater, art and music) and then continue to Prague, Vienna, Salzburg and Budapest. Travel between cities using trains. This is a flexible vacation package. Select your number of nights in each city, desired hotel and activities. Begin with Vienna`s 700 year old Christmas Markets, one of the most well rounded, continue with a visit to the stalls surrounding a glittering 100-foot Christmas tree on the oldest of Munich`s Christmas markets and with the Heavenly Workshop for kids and end with the best Christmas market in France, at Strasbourg,, complete with caroling choirs, Nativity plays, an ice rink, and mulled wine served in boot-shaped mugs. Transportation between cities by train. Vienna, Linz and Salzburg with the ICE Train. Europe is offering six of its most memorable cities with this customizable package. Start this once in a life time journey in Prague (the city of 1,000 spires where art and architecture have stood the test of time) and then continue to Bratislava, Budapest, Vienna, Salzburg and Munich. Train transportation between cities. This is a flexible vacation package. Select your number of nights in each city, desired hotels and activities. 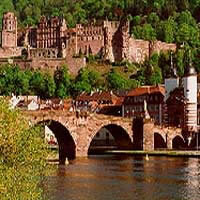 Take an exciting, unforgettable vacation through Europe with our customizable package! Begin your adventure in Munich (a haven of history and culture) and then connect to Innsbruck and Salzburg with ICE Train. There are multiple museums, public parks, historic sights, churches, restaurants and activities to keep you busy in each of these fascinating destinations! This is a flexible vacation package. Select your number of nights in each city, desired hotel and activities. Hotels were great for the price with enough space for three. The train and plane went smoothly. No complaints at all! Everything was perfect! Our second time using Tripmasters!